Cyclone safety and extreme wet weather were taken into consideration in the design. 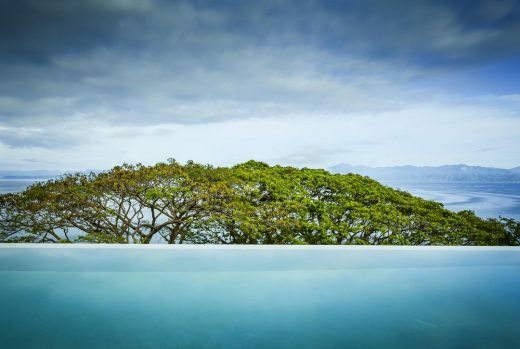 The wet edge pool falls to the backdrop of an enormous existing tree. 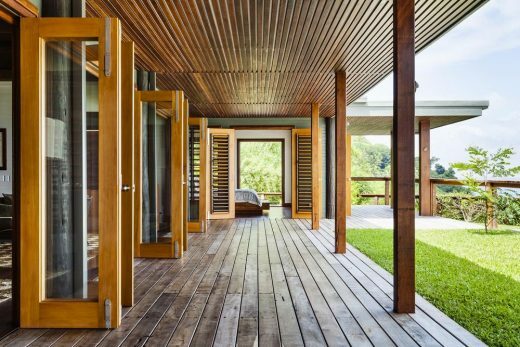 Madeleine Blanchfield Architects work is timeless, elegant and unpretentious. We believe that beautiful spaces can also be flexible and functional and create individual places that resonate with the character of the residents. We aim to be sensitive to site and context and use strong planning principles to underpin all our designs, then bring life to them with careful control of light and materials. Most importantly we hope that our spaces and are a pleasure to be in. 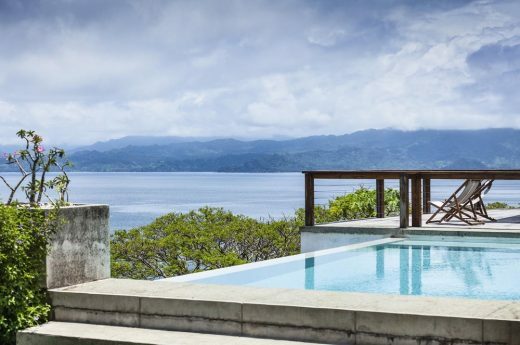 Korovesi is a 5 bedroom villa in Savu Savu, Fiji designed for a young Australian family who fell in love with the site on a holiday there. 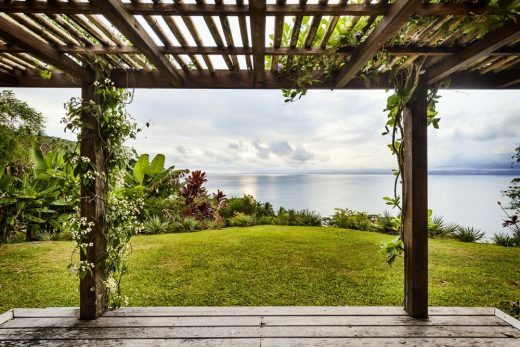 It sits high on a hill overlooking the ocean, surrounded by lush forest and the distant mountains of other islands. 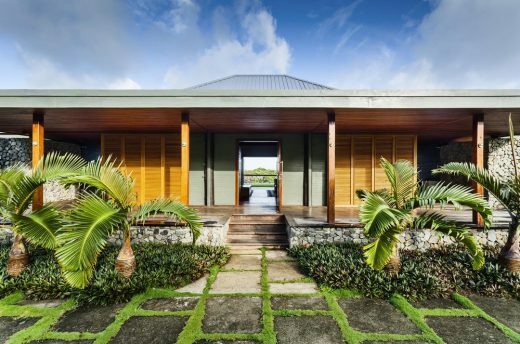 The brief was for a comfortable, open and spacious enclave that made the most of the incredible views and the feeling of outdoor living possible in the tropics. 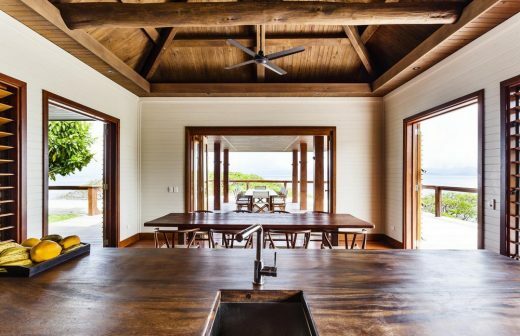 The main house has a huge living pavilion flanked by kitchen and master bedroom pavilions. The spaces are joined by covered walkways and cluster around a concrete wet-edge pool, which overlooks the ocean. The outdoor bathroom and staff areas are hidden behind stone courtyard walls and there is a grand outdoor dining room. Down the hill from the main house are caretakers cottage and several ‘bures’ housing guests rooms and massage pavilion. The materials are local timber and stone. The huge roof volumes use local post and beam construction methods. 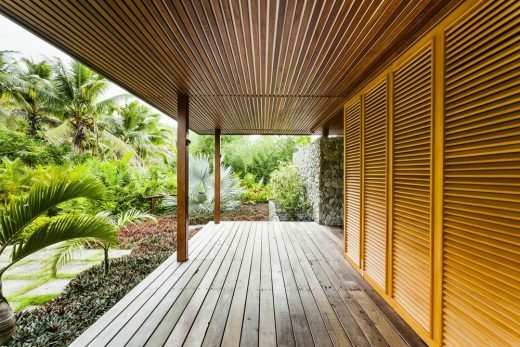 The spaces are enclosed by timber-louvred doors so that they can be shut down during cyclones. Covered walkways ensure that the separate pavilions can be walked between in the rain. 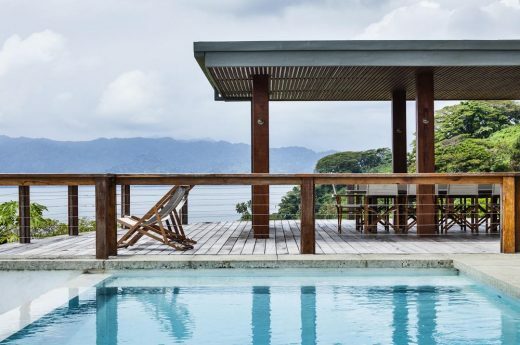 The villa uses vernacular methods with contemporary planning to create a fluid, relaxed and unpolished character suited to holidaying in a very special location.